The membership business model is one of the best sources you can have of reliable, recurring income. How do you go about building it from nothing? James Schramko invites SuperFastBusiness member James Eager to talk about his paid membership and its conception and growth from the ground up. 05:25 – Why a membership? 13:21 – How much content do you really need? 15:27 – How active does a founder have to be? 28:13 – Just how bulletproof is a membership? James S.: James Schramko here, welcome back to SuperFastBusiness.com. This is Episode 570, and we will be talking about how to start and grow a membership site from scratch. And for this episode I would like to introduce our special guest James Eager. Welcome, James. James E.: How are you doing, James? James S.: Doing well, thank you. You’re in the UK. I’m in Sydney. That means we’re at polar opposites of the day – my day’s ending and yours is starting, which must be fun having a new baby on board. James E.: Yeah, certainly it’s been a bit of an early morning. And I’ve had to learn to become an early riser from being a professional musician in my past and kind of being up all night. And now, yeah, I see a totally different side of the day. James S.: So, we’ll do the very abridged version of how we got to this point. I’ll give it a shot and see if you can fill in any gaps. You’re a professional musician, got quite the talent, aside from charming looks. And you came to SuperFastBusiness as a member of SuperFastBusiness membership when you had an event company. And that was a difficult business model, and at some point, you decided to flick the switch and you wanted to capture your music knowledge but in a more leveraged way, so you decided to start a membership. And that was about a year or so ago, just over a year ago, and I’ve been able to watch this from zero to now. And in terms of income, let’s just say that you have a five-figure annual income from this business at this point, at just past year one. But I will ask you this – has it made a difference in your life having this five-figure income? James E.: Yes, made an absolutely massive difference. As I said earlier, I became a dad about five months ago and because of the knowledge that I’ve learnt from SuperFastBusiness, working with you, building a team which was something you encouraged me to do right from the off, actually. When Oliver was born I took the best part of three weeks off and did kind of next to no work. It was the moment I deleted the support app off the phone, because I didn’t want that sort of being a distraction and it’s kind of never gone on back since. James S.: Wow. So OK, this is like the first major point, is that a membership has allowed you to take three weeks off with the birth of your son. Congratulations, by the way. James E.: Yeah, totally. Thank you, mate. James S.: When my first son came along, well in fact when all my kids came along, I still had a real job. And when my first son came along, I was pretty young. I was probably twenty-four or so, and my boss wouldn’t let me have a day off work. He wouldn’t even let me have a day off work for the birth of my own child, which I took anyway. And even when I did take it off, he wouldn’t give me a car that would accommodate a child seat. So, I had all these little obstacles. Apart from youth, complete and utter shock of having a baby and an unaccommodating boss. And I really needed to make my salary. So, you’re just in a position of strength there, where you have your own schedule and you’d built up a team, so that’s a very important point. Now I’m a huge fan of case studies with real customers doing real businesses. This is not a make-money market. This is a passion market or an education market. It’s somewhere in that zone. It’s in the music space. If someone wants to join your membership, if they’re really interested in learning how to play a bass guitar, where would they go? James E.: They would go to ebassguitar.com and on there, you’ll find the membership area of the site. But you can also find a lesson blog where I publish regularly so people can see exactly what they do, exactly what they’re going to get if they want to invest further. James S.: Great. So, in this episode, we’re going to just go through a few bullet points about what it is that you did to go from zero, where you were struggling with the previous business model, to turning this membership on and some of the journey. And it probably wasn’t always smooth, knowing how memberships can be. This is in line with some of the other episodes we’ve done, and I just want to reference those other episodes. If you like this episode, or you want to learn more about how other people have approached this, please check out Episode 562 with Russell, who was a policeman and decided to set up a membership for helping people pass the test; Episode 549 with Clint, who set up a health related membership site to help people with rheumatoid arthritis; Episode 547 with Kevin Rogers, he set up a membership to help copywriters to help each other and to get training and to find business opportunities within the copyrighting space; and Episode 520 with Jarrod Robinson who set up a membership, if you can believe this, a membership for PE teachers who want to learn tech, and it’s got a massive amount of numbers and he’s doing spectacularly well with that. So, this is part of that series of real life case studies. Let me ask you this, James. Why a membership? What was the catalyst for that? James E.: In the previous business, I was working in the events market. We were doing some incredible work and I’m fiercely proud of what we did there. But it was just so, so difficult to scale and get the volume, and that made it tricky from a cash flow perspective, and we were paying rent on premises and storage and there’s all the kind of things that went with a bricks and mortar business. And it was amazing, yet exhausting at the same time. And I actually kind of came into this, if I’m totally honest, by accident. I quit teaching three to four years previously, actually having sworn I’d never teach again. I never wanted to be in a room with a teenager again. I’d sort of burnt out on that. And I just wanted to get some teaching back in, just to get a little better cash flow and that was literally all it was. But I was playing around with this digital marketing thing. And basically, a very, very smart marketer called Ralph Burns gave me a headline and I thought, I’ve got to try this out. I was messing around with Facebook ads as well. I was quite interested, I loved the psychology of the Facebook ads platform. And so, I put this headline out there, and literally I’ve gone from banging my head against a brick wall trying to make Facebook work in the events industry through to getting sort of 20p leads. I mean, Facebook was a little bit cheaper then. But it was absolutely nuts and I went from a business model where it was hard, we had to kind of do the hustle and grind to get the work, you’re often beaten down in price, etc., etc., through to something where I just went, ‘Wow! People actually want this.’ And that was a real kind of revelation. As you say in a lot of your stuff, the offer that converts. I could very suddenly, very, very clearly, it was like a real moment of clarity. But then the challenge from that point forward of what I did with it next kind of came up. James S.: Ralph Burns is a very smart man. I have the absolute pleasure of coaching him and Keith Krance, his co-pilot. And I use that term because Keith is literally a pilot, and they have high-level Facebook training programs, and they run events around that, certifying people. So, really good tip. You got one great change and it made a leap forward. It’s kind of like this idea of a membership site has, by the sound of it, changed your life. James E.: Completely! It’s completely changed my outlook on business, the way I’m going to live life. I mean, me and my other half, we want to spend some time abroad, that kind of thing. And from having a sort of, I guess, bricks and mortar, a traditional business that would never been a real opportunity, so there’s this amazing world, which is really, really slowly opening up, and it’s just piece by piece we start to grab hold of it, really. James S.: Well, if you’re ever looking for venomous spiders and sunburn, please come and visit Australia. We’d love to have you as a guest. Now, I know you’re interested in the tactical stuff, because as a coach of yours in SuperFastBusiness membership, you used the membership really well. Would you be able to explain in a sentence or so how SuperFastBusiness is a resource for you? And I’m not just saying this as just a pure promotion for the membership, because I think when I talk about the membership, perhaps some listeners may not actually know what it is. How do you use it for your business? James E.: I use it kind of in two areas, I guess. There’s firstly the private coaching thread, which is between me and you. And when I get an issue or something that’s on my mind or whatever it might be, I go there and write a few paragraphs and you’ll write a one-sentence reply which will just absolutely hit the nail on the head normally. But also, there’s the area for the members, which is amazing, too. And what that’s turned in for me over a period of time is a resource to actually meet people, get subcontractors that I want to work with, or just throw ideas out there and know that they’re smart people who will have another viewpoint on it and will show me where to take these particular ideas next. Or it might give me the catalyst to figure that out. James S.: Do you know we’ve had 704 exchanges in the last year? James E.: Wow! That’s crazy, I never knew. I never knew that. James S.: We’re up to 36 pages. So, I just wanted to, I mean, I invited you to come and talk about your experience with the membership and what you’re doing with your membership and how you’ve used my membership, because you use it well. And some people sit back and don’t use it at all, which really actually surprises me. And then other people use it well, and I wanted to explain what it is that you’re doing well. And that’s, you ask questions, and because it’s a discussion between just you and me, you can ask in confidence so that the business IP is not being used by anyone else. And secondly, you can ask in vulnerability. You can really expose yourself to the harsh realities and truths, because no one’s seeing it and you won’t lose any face or be embarrassed by the answer. It’s just us having a chat. And I’ve really enjoyed working with you inside that community and I’ve also enjoyed how much you’ve shared with other members who are, I’m going to use the word “keen” instead of “eager” to avoid a nasty pun, but they’re very keen to see what it is that you’re doing and what you’ve learnt. But let’s share some of those lessons now. I think this will be the really exciting part and I’m going to ask my team to make a checklist out of these responses so that someone could apply this checklist to their own business. Let’s talk about when you open the membership. You used a strategy that I strongly recommend, of early bird pricing. Tell me about that. James E.: Yeah, when I started the membership, I’d got, what, six to nine months’ experience before that. I’d built a few courses out by that point. Actually, I think I’d built two and a half proper courses by that point. And obviously I had the anxiety going through my head, do I have enough content? The reality of the situation is, yes, I had plenty of content to get that going. Because during that nine months before, I’d built up a lot of goodwill with my audience. People were already starting to feel, I guess they resonated with the way that I taught. So just giving them a really super good value option into something new and exciting was just the way to hit the ground running. And that’s what gave me, I think, the first 40 or 50 members over the three days before Christmas in 2017, actually 2016, which was a great way to spend Christmas, I have to say, having really felt like I’d achieved something that year. James S.: So, you had this onslaught of new members because you gave them early pricing. And the way that I explain this when I’m coaching is that these people are taking the risk on you, they’re the first people to the party, they should get a special deal as a reward for that. And that also will allow you later on to lock them in in a nice way, but to basically gift them that lower membership rate even when you put your prices up later on. And they tend to stick around longer because of that, so it’s a retention strategy. It is a way to bring in a bunch of people at once. Because some people ask the question, how many people do you need and how much content do you need? So, we’ve addressed the first one. I think that it’s great for a low-priced membership, and I call a low-priced membership anything under $100 a month. You probably should have somewhere around 50 to 65 people would be a nice bunch of people to put there at the beginning. And you can do that by having a waiting list, and then early bird pricing, as a special. And you probably should raise that price multiple times. When I opened SuperFastBusiness, we went from 47 to 57 to 67 to 79. And over each price rise, we got a new bunch of members, and the previous bunch were locked in on a great rate. In fact, the market rate now for my membership is $199 per month at time of recording this. So, anyone on $47 a month is almost stealing their membership, which is great. They must feel very lucky. Do you really need a lot of content? 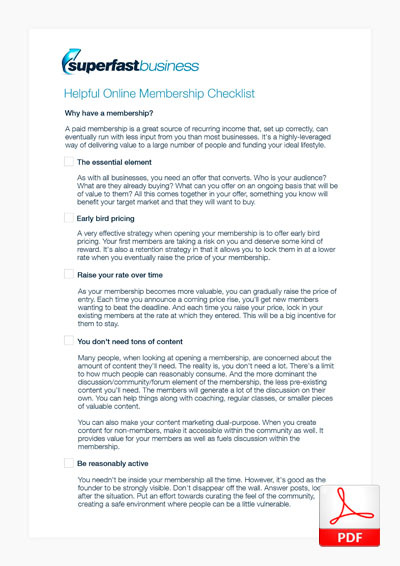 Point number two, how much content do you need to create for this membership before you open? Because I know this is a huge concern for people. They’re thinking they have to get all their ducks in a row, they’ve got to go and create stuff and map it all out. And this might take years in some cases. I’ve seen some people take multiple years while they’re still creating their course content, and they may be surprised with the answer. How much content did you have, James? James E.: I had two and a half. I was halfway through building my third course when I did that. There were some smaller pieces of content in there. But the membership, as you rightly say, is all about the results. And so there was other things that I could throw into the mix to get it going, like some private coaching with me. What else? We started doing some monthly masterclasses, and the full course is still going on. But what I found as time goes on is I can build the membership just by using some other smaller strategies, by putting smaller pieces of content in to give the value that way. I mean, firstly, I’ve learnt that particularly in the hobby market, these people don’t have hours and hours a day. It’s not the same as a business owner who wants a course because it’s radically going to change their life at the end of it, or they think it will. This is people enjoying their hobby, so they could probably only do a few 10-minute lessons every week. I mean I’ve probably filmed 120 lessons at this moment in time, maybe more, for the membership. So, if you look at it that way, people take a long time to kind of get through the content. James S.: Right, yeah. I’ve started memberships with virtually no content, just a couple of discussion threads. I would say a rule of thumb is, the more discussion or community or forum element, and an extreme example would be a Facebook group, the less need for pre-existing content. Now the more that it’s a course or training and no community aspect or commenting ability, then you might have more content required. But that being the case, you can still have very small, easy to consume courses, and you can still charge plenty for this. I know people who charge a lot for very little, and they’re getting a good result with it because their customers are able to consume it, and they’re able to get a result in excess of what they pay for membership. So, let’s move on to part three. How active do you need to be if your community is discussion-based when you’re curating this group of people? James E.: I just make sure I’m very strongly visible at all times. I’m not in there the whole time. I’ve found that as time goes on, the members start leading discussion, which is an amazing thing to do. But I just don’t disappear off the wall. I make sure I’m in there, and I also just try and curate the feel of the community. It’s like I’m a curator in like, an art gallery would have it. I just look after the situation. And one thing I found I can do is I can really strongly influence the culture by giving a safe and secure environment where people can be a little bit vulnerable. And one of the things that the members love doing at the moment is putting up cover videos of them playing along to tracks. And that takes a lot of confidence for someone who is an amateur to do that and post them doing something they may feel very insecure about. But I’ve made sure that that’s a safe place to do. And if I’ve seen any negativity from people, I’ve sort of hit that one on the head and taken that out there. I’ve also, within that community aspect, made sure that other people don’t advertise in the group. I’ve found that the members, they can get kind of fiercely protective of me at times. It’s a strange thing when I saw this happening. But when another teacher started (because this is on Facebook, in the free Facebook group), started putting their content in there, they really didn’t like it. I found they’d got a lot of respect for me as a teacher and the business model that I was sort of setting up behind that. But also, occasionally, we get some sort of crazy religious posts in there or something like that. They have to go straight away, because people don’t like that. And I found I’ve got, over a period of time, I’ve got a real feel for what they want and they don’t want. I can make the choices to make it the safe and secure and fun environment where they want to come and hang out. James S.: Yeah. I sometimes say it’s a bit like being a parent. And you probably know what that means more now than last year. James E.: Yeah. Oh yeah, totally. James S.: You’ve got this, you know, it’s a 24/7 responsibility. But there are times when it can sleep or you can sleep and you have to down tools a bit. Just for some stats for benchmarking, in my own community I’ve just noticed I’ve ticked over six years in its current format, but it’s been going for about four years before that or three years before that. But six years, we’ve had 1020 members contribute 170000 posts, and I’ve done 32000. But what that means is that the members have actually contributed almost 140000 posts, so you don’t have to do all the work. They will share and contribute and help each other, so that’s the really important point. Now, tip number four is team. You set up standard operating procedures so that the team can start doing things for you. How many people do you have in your team, be it part-timers or full-timers? James E.: I’ve got two guys in my team at the moment. I’ve got my VA, Paolo, who’s an amazing dude who’s in the Philippines. Just super, super smart and quick and that kind of thing. And I write SOPs. I actually really enjoy SOPs – I get a real buzz out of writing those and doing the video training to go with them and watching him nail that first time and getting something off my plate. I often dread writing them, but it’s a kind of an amazing feeling when it’s done. And the second is, I have a videographer who lives in the same town as me. He’s a high school guy. He’s a smart dude as well. He’s very, very rarely ever late. He’s not a flaky teenager, anything like that, and can work to deadlines. And he comes over and does my videoing once or twice a week and takes it away, edits it, puts it up. Between him and Paolo, they work well together and get everything up online. And I mean there are times when I really don’t actually have too much to do with it, apart from creating the content. James S.: Yeah, that’s really good. Team is important for me, too. And for context, or for benchmarking, just to give some ideas to someone listening to this. In my business the team will collate the weekly news discussions, they’ll put them into a newsletter and send that out to our members. They’ll also handle all things to do with billing, credit card changes, user access, onboarding, etc. Those sort of things are handled by the team. And of course, which sort of rolls into the next topic, my team are very helpful when it comes to the content marketing side of the business, which is the primary method we use to fill our membership. And I think you use some content marketing as well, James, with a little dabble of paid traffic. But you do build assets that will be sort of working away for a long time. Is that right? James E.: Yeah, that’s totally right. And one of the things, I meant to say this a little bit earlier, I missed my second point, but it was the strategy of how I use that free content. And the thing that I’ve started doing now, and this comes off the back of kind of adversity to a certain extent, because the YouTube algorithm has got quite difficult to use from a copyright perspective, so I can’t use any copyrighted tracks. So, what I do is I get them remade or a section of a song remade, and so I’ll have the free video and they can opt in to the list to get the content upgrade. But what I then do is, I put the backing tracks inside the membership, so the members get that little extra perk. So, by releasing content on YouTube, it’s actually feeding the membership at the same time. And sort of psychologically, that’s made it a lot easier for me to build content, to know that I’m sort of boosting every side of the business in the process. James S.: Yeah, we have a similar thing too. When we post something to our blog, it automatically gets pulled inside SuperFastBusiness in a section which we call Posts From The Blog. That’s a very imaginative thread. But we’ve been able to automate that with some fantastic wizardry from the genius that is Dave Wooding from, gee, he’s got recommendwp.com, and he’s been working on my memberships for the last decade. I super, super recommend Dave. And what I’ve found is that people like discussing the blog post inside the membership. So, we’re not getting so many comments on the blog anymore, often we’ll get 100 or in some cases up to 675 views of these posts within our discussion forum. And sometimes we’re getting up to 80 replies to there. So, when I post something in a blog, members are able to get inside and under the hood and say okay, that post, I really like this or that, or how did you do this, or what did he say about that, or what other resource would you recommend? So, it’s a place where you can expand upon it. Because I think when you do a membership the way that we do it, sure there’s content, and that’s available publicly. But there’s also a community where people can discuss with each other. And then there’s the coaching aspect. So, you can reveal a lot more about how it’s done and it’s like, it’s basically like getting a backstage pass at a rock concert. You can watch the performance, and then you can go backstage and say, “Hey, when you were doing that song, why did you switch guitars?” Or, “Was that drum solo hard for you to physically do?” You know, “How long did you have to practice that?” like, you can really go deeper and get a lot more information on it. So, I’ve found that even though it seems counterintuitive to share private content publicly, it actually still creates a lot of value for the member. And it’s a fantastic demonstration for people on the outside. I mean, someone listening to this on their iPhone on a bus or at the beach, who is not a member of SuperFastBusiness, can get a feel for what is inside by us sharing this. But a member can still get great value from listening to this podcast with James Eager about how he built his membership from scratch. So next topic is around price points. It can be quite hard to sell a membership straight up, and I do it by publishing a lot of podcasts and talking about it over and over again, like a dripping tap. Eventually, anyone who comes into my world, whether they buy my book or listen to a podcast, is going to find out that I have SuperFastBusiness membership. And they often will go on the waiting list, and at some point, they will purchase. Now, you have tried other things too, like front-end products or low-ticket items. Would you like to talk about that? James E.: Yeah. One of the things that I do is I’ve tried some small product purchases on the front end. So, I’ll take a course down to 7, 9, 15 dollars, that kind of thing, to create a customer. And one thing that I found off the back of that, not only does it start to negate traffic costs, but it will start creating some goodwill. By and large, when I look at what’s going on, the journey that a new member’s taken when they sign up, they would have already experienced one of these courses. So, it’s something that’s worked really well for me. James S.: Perfect. And I will give a big tip here. It’s really easy to sell a membership from the back of something more expensive. So, an annual influx for my membership is straight from my live event. Our automation software, called Ontraport, will check when someone buys a ticket from our shopping cart, which is ThriveCart, and they will receive a message from me. If they’re not a member of SuperFastBusiness, they will receive a message from me inviting them to take a trial offer. Because they’ve just bought a ticket to my event, which will be somewhere in the region of 700 to 2000 dollars, and I’ll offer them a trial of SuperFastBusiness membership that will then start billing if they stick around. And what we find is, from around about 100 people who get made that offer, about 75 people will start the trial and about 65 of them will stay past the trial period and stay as a member. So that’s a great way to increase your membership, is to put a more expensive product in front of it, whether that’s a masterclass or a live event or a bundled package of some kind. See if you can at least put an automation or a thank you page offering your membership as the next logical step to get more help. So, tell me about building goodwill. You got a bit of a surprise with an example of a student whose credit card expired. James E.: Yeah, I mean this is a prime example of why SuperFastBusiness is amazing. And I knew that my yearly members weren’t going to be coming back around again at some point and the chances are that credit cards will change. And I was fully expecting quite a lot of them to fail, just because it’s not unreasonable for that to happen. And I put a piece of software in there called stunning.co, which sends out emails to try and sort of effectively scoop up people whose credit cards have expired and giving them an option to fill in their credit card details again. And basically, I put those emails together. I was a little bit reticent to do it, because it was another piece of tech that I needed to learn at that particular time, and it just, it seemed a little bit of hard work. But anyway, I did it. And I can remember, I think it was Jarrod Robinson and someone saying, you just got to do this inside the membership. So, I did it, and actually in reality it was a lot, lot easier than I ever thought. It was about an hour to set this thing up. But lo and behold, it came around, the yearly members. And a guy’s credit card failed at that point. And it was a guy who I had given a couple of Skype lessons to it in the early days, and I’d had quite a good rapport with him. But he got off radar and just I thought he’d moved on to the next thing and I just thought the credit card was going to expire at that point. But strangely enough, he updated his credit card information and then the payment went through and he is in for another year. And what I realized at that point is the goodwill is going on all the time without you actually even knowing it. Particularly when you’re publishing content recently, you might not get anything back from people. They might be off doing other things in their life. But they could be checking in with your weekly lessons every so often. They may not feel the need to communicate with you all the time, but the goodwill is always happening, which is really cool. James S.: Yes, it becomes super apparent when you have a live meetup of members, and I actually hold meetups all around the world. I’ve just done Brisbane, Melbourne, Sydney, and of course I met you in London. It was just, what, half a year ago, you came to the meetup. What did you think of the meetup for the local crew in your region? James E.: I think it’s essential. I met some amazing names in there of people who are doing some seriously great stuff in this industry. But also, some people which were in similar positions to me or even earlier in there, in that sort of learning curve, and I was able to give them a few tidbits based on my experience. But then I could look up to those guys which are doing some amazing stuff and start to learn a little bit from them. But the network then starts to grow from that point forward, because you then get relationships with these people and that’s when things can really take off and stuff can get really exciting, I found. James S.: Let’s talk about how exciting it can be. Let’s say you’re doing one-time product launches or campaigns, which is very common in the internet marketing space, and you have a bad month. How important is it to have that membership there as a backup? I’m curious. We’ve just been through Christmas at time of recording this. Did anyone stay? James E.: Yeah. Basically, my retention was incredible over December. Much, much, much better than I ever anticipated. And the other surprising… well, it’s not surprising but it just shows what a bulletproof model this membership model is, that I actually put an offer out for December, which really quite frankly didn’t do as well as I hoped. It was disappointing. And this just shows you’re learning the market, your particular market all the time. It could have been because of Black Friday before, it could have been just for Christmas it was the wrong time. It could have been that I needed to put it out in January when people were in that New Year mindset. And I was naturally a little bit disappointed of that. But the yearly membership came around and I ended up just having the best month ever. And really, it wasn’t because I’d done an amazing promotion or a launch or anything like that. It’s just, like you use this analogy of the diesel locomotive – it takes a long time to get up to steam, but once it’s there it stays there. And I’m really starting to see the evidence of this, because the first six months of running the membership were hard graft, because I’d see a trickle of new members come in every month. It wasn’t like the big launch where I got 30, 40, and secretly deep down I was probably hoping that every month would be 30 to 40 from that point forward. But it isn’t. It’s not that, it’s a slow burn and then it sort of starts to become exponential. And definitely within the last three months of the year, that’s something I’ve seen. James S.: Well I guess you probably realize this, but each month now you should get renewals. James E.: Yeah, totally. And there should be renewals coming around. And my job is to make them want to stay and something I’m going to put in there. Particularly, I’ve got the pricing point come about March or April this year. It’s up at where I want it to be, so I’m going to put a loyalty discount in place, I know, 10, 20 percent discount to say thank you for staying on, which is another little trick that I’ve learnt from you. James S.: Excellent. Well we’re not doing anything too tricky. But the thing is, if you can actually keep people that you have and then add a few more, over time it becomes a snowball. And in my membership, which I’ve now, I’m tracking six years’ worth of data, I can say that we have people stick around almost three years. Our current active members have been there for almost three years, which is really stratospheric compared to an often-quoted industry average of three months. And I’ve become so specialized now in retention that I published a specific training on exactly that topic. And I also published a specific training on how to sell the membership on autopilot so that you never have to pick up the phone or do big launches or any of that. It’s automatic and runs like a machine. And both of those trainings are inside SuperFastBusiness membership, and one of them was so popular with another expert who saw me present on this topic once at a high-level mastermind, he’s rolled this out for his product as well. He’s basically just replicated and even asked me for some advice on it and permission to use it and it was all fine and he’s going to get some great results from it too. So, this stuff’s very effective. How much can a leader share? Now, let’s talk about how much do you share as the, I guess, as the leader of the pack? Do you hold stuff back or do you make yourself vulnerable? James E.: Well, this is the interesting thing. I mean, I’m quite a reserved kind of guy, quite low key. I’m the bass guitar player, I’m used to being at back, although granted I think anybody who gets up on stage probably does have an ego to a certain extent. But I’m not that guy who likes to be in the spotlight, so that’s something that I’ve had to learn how to do, is to share more of myself. And I experimented with this stuff over the years and so in the Facebook group I’ve got for the members, I’ll put a picture of myself and the family up there and see the response. And it’s quite interesting when you start sharing more of yourself. People get more and more engaged with you, and they start to feel like they know you. And it’s funny, this actually started off with the cats that I’ve got, but then moved into Oliver my son when I put a few pictures up there, to the point where we do a live monthly masterclass. And at the end of last year, it was getting really near Christmas and getting a guest on the show, particularly with how busy professional musicians get at that point was going to be tricky. So, I thought, I’m going to have a Christmas party, and I thought this is kind of just a good way for me to spend an hour with the members, answer some questions, just tell them how grateful I am for them sticking around for the year and how I genuinely, honestly, really do appreciate them and I put this up there. And one of the members said, “Oh, can you bring Oliver on? I’d love to see him. I’ve got six of my own grandchildren.” Family is a big, important part of their life and they wanted to share that experience with me, and that was brilliant. And so, I actually only did the masterclass at half past seven in the evening, I moved it forward a couple of hours so it didn’t get in the way of bedtime. And he came in and spent, I don’t know, 10 to 15 minutes sitting on my knee being good as gold whilst I answered questions about the bass guitar. It was a bizarre experience, but very, very cool at the same time. And it made me realize how important sharing my life and how connected they are with me as a person and the stuff I’ve done and the way I communicate with them, so I really am sort of leading and curating this community of people. James S.: Yeah, I’ve observed that about you. You are very patient and kind and caring and supportive. But there’s one thing that you do really well and maybe we’ll finish up on this point, is that it seems like you always have an open mind to be able to understand more and you don’t get locked into being some kind of an expert too early. You do question things, and you’re certainly not afraid to ask questions. You ask me plenty of questions, and I always answer them. And I just want to say how rewarding it has been for me to watch your personal growth over the last year or two, where you’ve really grabbed the opportunity, you’ve applied yourself, you’ve walked over that broken glass and you’ve eaten beans, as a few of my mentors used to say. You’ve been through the most difficult phase you’ll ever go through, and it’s just going to get easier from here on in because you’ve built up confidence, you’re inquisitive and you apply yourself. So, let’s just talk about your attitude there. Is this something you’ve had to work hard on, or is it just your natural disposition? James E.: I think, just as I’ve got a little bit older – I’m 37 now – I’ve just become more and more open-minded and I started to realize that the more open-minded I can be, and just accepting and questioning, the more I’d learn in a situation. I guess the interesting thing is, we come into this kind of world, when you hit the Internet marketing world, there’s so much training, podcasts, etc., out there. And first of all, you’ve got to find the mentor, the person, the guru, whatever you want to call it, that you resonate with. And for me, that was you, just because your business messages were so, so strong and there’s so much we are exposed to from people claiming that one funnel will change your life. That’s a very strong marketing message at the moment going around and really, you actually teach business, the whole holistic side of business, which is what I love from getting a team, getting your pricing right, getting the offer that converts. And that’s so, so important. And I guess the other thing is, you taught me to question everything, because when you’re in this early phase, I mean I’ve met other people who are just the same, they’re soaking up, they see this amazing world of online business and they just want to learn everything about it. But you kind of get sucked into stuff which just isn’t quite accurate. And one of the classic ones for me was like, every person on your email list should be giving you a dollar a month. And I took that as verbatim for a while. Then I questioned it, and just went, that just can’t possibly be true in any way. Because initially, it was the kind of thing which made me feel bad about what I was doing because I wasn’t doing that. But then I looked at, that can’t be true. And I remember asking you that question, and it was a case that there were so many people with much, much smaller e-mail addresses, email lists rather, but doing hugely high ticket price offers. I’d know two, three, $5000, so that really doesn’t work out there’s one dollar an email address, etc. So it’s just that questioning and keeping questioning the whole time, and that’s what I feel makes me learn the whole time. James S.: Yes, perfect. Well, I was going to ask you if you would recommend SuperFastBusiness to other people, but I know for a fact that one of your referrals just joined recently, which I’m super grateful for. So, thank you for that. James S.: So, in closing, I just wanted to say a big thank you. You were under no obligation to come and share this information. I’m sure that you’ve definitely helped other people. 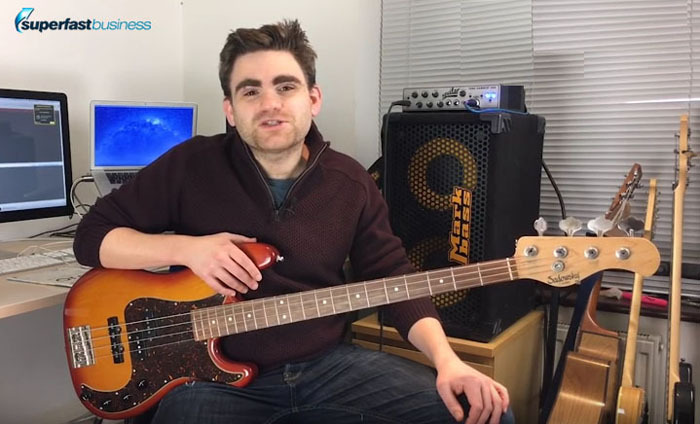 If someone listening to this is interested in learning about bass guitar, I’d recommend you go and check out ebassguitar.com. James Eager, it’s been such a pleasure having you on the show. If you’ve been listening to this and you feel like SuperFastBusiness membership, where you’d be able to chat with me and James Eager about your business or starting a membership or growing one, then I’d be happy for you to join, just go along to SuperFastBusiness.com and join the waiting list. Thank you so much. James E.: Thanks for having me, James.